The All Clear System provides a Safer Clearing Procedure. Problems with most common clearing procedures. Protect employees when clearing a facility. All Clear is the first technology-based system that protects employees as they open and close a branch. And when your people are protected, so is your institution. All Clear is simple to use, invisible to potential thieves, and protects your most important asset…your people. What’s more, it will keep you in compliance with regulations, and automatically capture staff comings-and-goings, too. Safely clear your facilities with a single person – flexibility by providing a safe alternative for entering the facility. How do you know if your employee got to their car safely? Were they forced back inside? Let them tell you when they are safe. This allows employees to come back at a later time – knowing the facility is empty and Not Clear. Get text / voice / email messages when an employee does not indicate they are safe while opening or closing. Manage your security procedures with easy to use tools. Who cleared the facility? Who used it to leave? Ensure your opening and closing processes are being followed with documented results. Send messages to all users when there is a major event such as a weather related event or a robbery. Instantly notify everyone at the location there is an active shooter event in progress. All Clear System protects your employees and assets, it also automatically gathers much of the data you might need to satisfy regulators. It’s a system that actually makes your job easier, and makes your institution more secure at the same time. Don’t put off tracking data and keeping up with policies or continue outdated methods of recordkeeping and security procedures. Protect employees when leaving or closing a facility while staying compliant with Federal regulations. Much like pulling the fire alarm, every employee has the ability to signal an event. There is no longer the need to alert a central authority and then wait for them to get the word out to everyone. 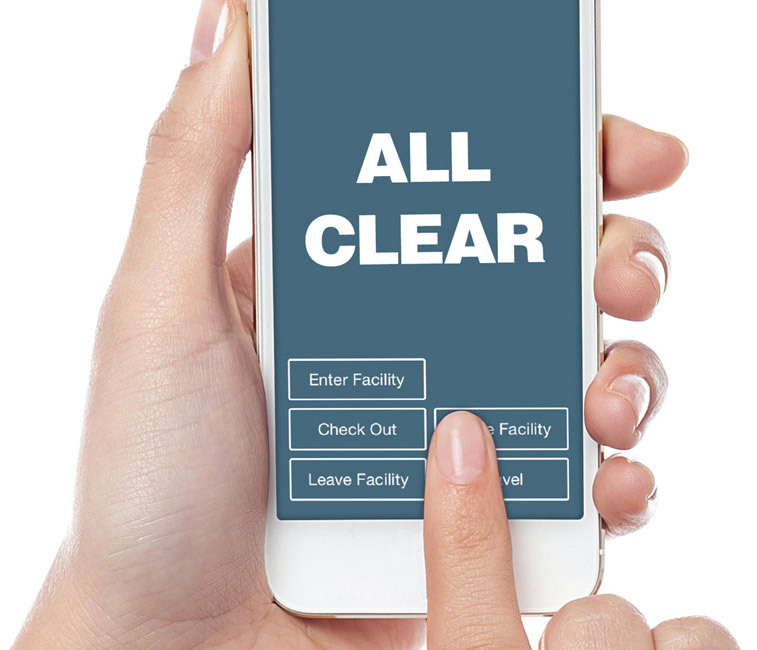 The All Clear System works 100% by a mobile application and the All Clear Cloud. Apps are available for Android and the iPhone. Once you download, contact us to set up your facility. System manuals are available for All Clear System customers. Please enter the password provided to you by your employer or All Clear System Representative to gain access. Is All Clear just another phone app? Which phones does the All Clear App run on? What about Windows and Blackberry phones? They are not currently supported by the All Clear App. There are some Blackberry phones that have the capability to run Android Apps. I don’t have a smart phone, can I still use the system? Yes – there is a Text version of the system that offers most of the functionality of the mobile app including entering / leaving / indicating you are safe. Will the All Clear App use up my data plan? No – for an entire month of normal usage, the All Clear App uses less than what it takes to load a typical web page one time. Does it cost anything to download the software? No – the download and updates are free from either the App Store (iPhone) or Play Store (Android). Why does Wi-Fi need to be turned on? The phone’s location services give a more accurate reading when the Wi-Fi is turned on. You DO NOT have to be connected to a Wi-Fi network, just have the feature turned on. Does the All Clear App track me? No – the system looks at your GPS when you press one of the buttons to determine which location(s) you are closest to. Will the All Clear App drain my battery? The system is generally used when entering / exiting. After you have safely entered or exited, the app can be shut down and will eliminate any usage of battery or other resources. On most phones, it is typically not a problem leaving the app running in background. Can I put the All Clear App in background while it is running? Yes – the application will remain open and when the icon is clicked on, it will bring you back to where you left off. An example – if you have an Exit to Safe running, the screen will bring you back to the option to press SAFE. Can I “turn off” the screen while the All Clear App is running? Yes – this is treated the same as if the app is put into background. Does the All Clear App use GPS while running in the background? No – when the All Clear App is in background, it does not use the GPS or Wi-Fi. I don’t get a GPS signal in the building? If you have gotten the First In message and are the opener, the system does not check your GPS coordinates to complete the opening. If you are using the Exit to Safe and there are no GPS coordinates available, the system will give you a list of branches to choose from. How do I shut down the app? For example on the Samsung if you press and hold the home key – you will be presented with a list of running applications. Swipe the All Clear App to the left to close it. How close to the location do I need to be? This is customizable for each location but generally around 300 meters. What if we have two locations that are close together? The All Clear App will give you a choice if there is more than one location in range. What if there is a bad event and my phone is taken or destroyed? The phone is used to start and stop the timers. Once a timer is started, if you phone is taken or destroyed; the timer will expire and notifications will be sent out. Does the All Clear System replace or affect the alarm system? You fail to clear the location in the allotted time. You fail to reach your safe location in the allotted time. Why can’t we just keep doing what we are doing? Do I have to use the system every time I enter or exit? The All Clear recommendation is yes but each institution will have its own policies and procedures. Why would I use it every time? When you use the “Enter” portion of the system, it records which location you have entered. By using the system’s console, authorized personnel can determine who was in the location that day. An example of when this might be important would be when bad weather strikes an area and it is important to know who was at that location today. When you use the “Exit to Safe” portion of the system, not only does it indicate you have left the branch in the event of an emergency, but it also provides your own personal timer to make sure you have reached your safe location. Perhaps it is dark or there is bad weather – a simple fall can become life threatening. Is there a distress code? While there is an option to enter a distress code, a better option might be to simply allow the timer to expire and to not draw attention to the All Clear System. Others will not enter the location because you have not indicated it is safe. As soon as the timer expires, notifications will be sent out. Each institution will have their own policy on how to use the system, please consult your institution’s policy.